This classic snack loved by kids and adults alike is satisfying and easy to have in between meals. The first cautionary warning out of some individuals is that nut butters are high in fat. This baneful advise is partially responsible for the negative health stigma associated with fat. It is true that if calories are consistently over consumed then weight gain is inevitable. However, excessive calorie consumption can be related to carbohydrate or protein intake as well. Fat does contain a higher energy density with 9 calories per gram compared to protein and carbohydrate's 4 calories per gram, making it easy to exceeded calorie needs. But unless trans fat is being discussed, there is no scientific link to fat, even saturated, and disease risk. In fact, fat's mouth-feel and flavor increase the satisfaction one experiences when eating a meal. The presence of fat in the stomach activates the production and release of several hormones that signal the sensation of satiety or fullness. These two reasons help to explain how fat staves off hunger for longer periods of time and decreases the chances of eating foods that do not have similar biological outcomes. Plant based sources of fat, such as nut butters, are associated with other disease fighting nutrients making it a superior food source for this macronutrient. If concerns over nut betters are to be raised it should be centered around the sugar content and hydrogenated oil. Sugar's role in negative health outcomes far out ways any that can be blamed on fat, with the exception of trans fat. Hydrogenated oil can serve as an alternative name for trans fat. The molecular conformation influences the way it interacts in the body by allowing it to inhibit anti-inflammatory pathways. This is significant because inflammation is the foundation of all chronic disease. Choose nut butters that are natural as they tend to be lower in sugar and do not contain hydrogenated oil. Each nut butter has different nutrient benefits so I suggest taking the time to read some of the labels and compare almond, peanut and cashew butter. Compare calories, protein, sugar and minerals in each to make an educated purchase that fits your particular health needs. To decrease calorie intake with this snack buy smaller apples. Apples are not suppose to be the size of a melon anyway and you will be less likely to eat larger portions of the nut butter. Another strategy is to dip celery sticks in the nut butter. Celery has next to no calories and is a better option if sugar consumption is of concern. 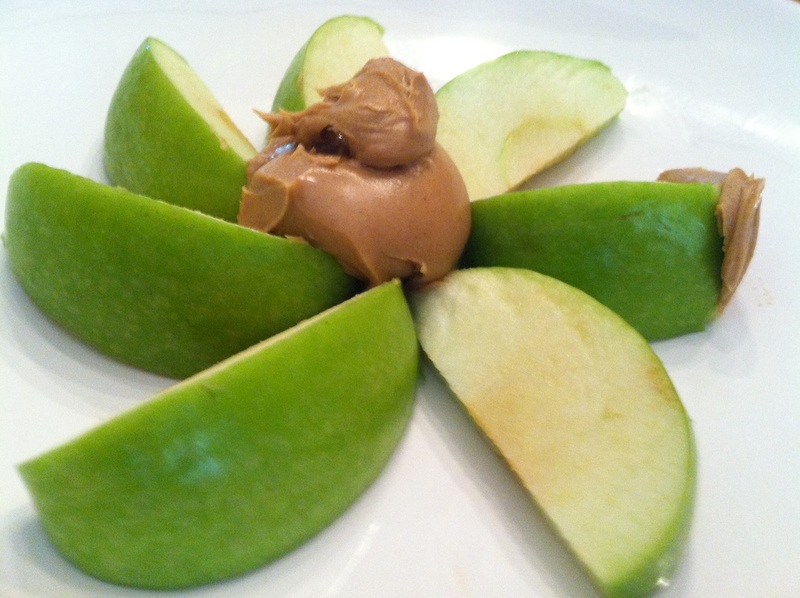 Enjoy this snack anytime during that day with all of the health promoting nutrients in the nut butter and whatever plant food you choose to dip. Several peanut butter powders have recently emerged on the market. They are significantly lower in calories because after the nuts are hydrated the fat is removed. Eating food in their whole form is always superior to but when alternatives are needed these nut butters can provide a satisfying and low calorie substitute. Some brands I have tried and like are PB2, True Nut, and PB-Fit. I mix mine with my Flaxseed milk for a bit more sweetness. Some of these brands have other flavors like chocolate and are worth checking out. Directions: Cut up the celery or apple into uniform slices. Celery will keep for several days in the refrigerator if it is stored in an air-tight container. If you are planning on transporting the apple and eating it at a later time use lemon juice to prevent browning.